Hello, there! Steve made two beautiful Pendoflexes for our friend Dr. C.M. 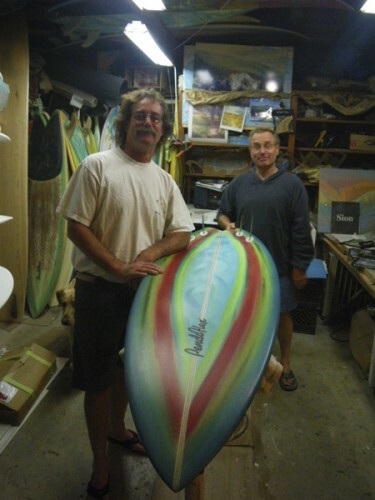 The 5′10″ x 22″ single wing fish is a hand-shaped EPS high aspect twin fin, with small trailer that can also be ridden as a twin fin keel set up. The 6′5″ x 19.725″ swallow tail is a hand-shaped PU quad with a Lockbox fin system, ready to give Santa Cruz a run! Have at it laddie! No Comments on "Beautiful new Pendoflex Fishes for Dr. C.M." « Give ‘em a Pendoflex!